A tech pack is a crucial tool when it comes to apparel manufacturing, but you may be one of the many new or aspiring designers who have never heard of the term.best laptops for gaming under 50000 Don’t worry, that’s where we come in! So, what exactly is a tech pack, anyway? In short, a tech pack, or technical design package, is best described as the blueprint for your apparel design. It is a way for the designer to communicate to the manufacturer exactly what a garment should look like, down to the last detail, to ensure product consistency. A tech pack tells the manufacturer what the dimensions of your garment will be, the kind of stitch you want to use, as well as where you want to use it, what exact colors (colorways) and fabrics you will be using, and whether you are adding ruffles, pleats, or embellishments. These are among the many things a tech pack is used for when developing your own garments. The inspiration behind the garment, the conceptual design, and the technical details all lead up to creating the finished product. For example, let’s say you see a sweater that you love, and you want to draw inspiration from it for your own design. From there, you will want to take that inspiration and conceptualize it into something of your own, whether it is by adding a print design, some lettering, or graphics, and then play around with different styles until you find the one that’s perfect for you. After that, the technical design is crucial when it comes to bringing your vision to life. 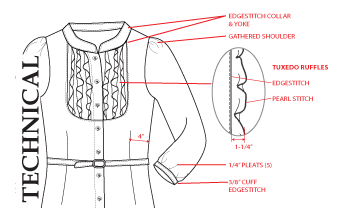 The positioning of labels and graphics, the length of shirt sleeves or pant inseams, the location and depth of pockets, and the types of stitching are all part of what is included in a tech pack, so that the desired outcome can be easily communicated and consistently achieved. Make sure to Contact Us for more information on our technical design packages!